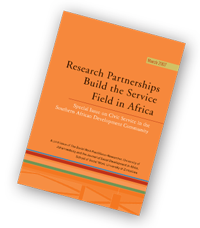 In partnership with the Global Service Institute, VOSESA publishes Service Enquiry, an online publication available free-of-charge that documents and analyses the experience of civic service and volunteerism in different parts of the world. VOSESA also holds the managing editorship for this publication. Service Enquiry is published at www.service-enquiry.org.za. 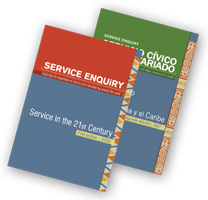 The first edition of Service Enquiry was published in 2003 in English and Spanish and focused on civic service and volunteering around the world. As at December 2006, the English language edition has been downloaded more than 11 000 times and the Spanish language edition more than 5 300 times since publication. The second edition examines civic service and volunteering in Latin America with a strong focus on youth service. It is being developed in partnership with CLAYSS, a non-profit organisation based in Buenos Aires, and will be published in 2007.